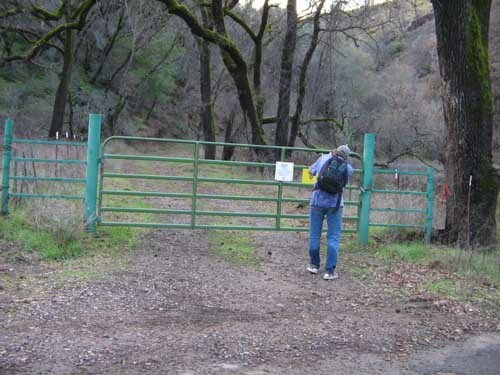 Pass through the green gate, hiking back along the dirt road which follows Zim Zim creek. A few routes will spur off, heading back into the hills. Stay in the valley, heading up the canyon along the creek. 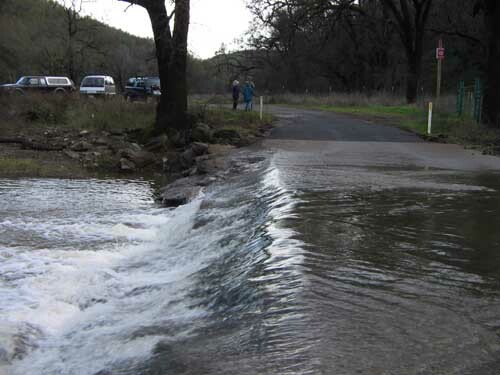 There are 8 or 9 creek crossings on the way, so you will get wet. When you get near the end of the valley, you will see a pink-colored boulder in the road, at a fork in the trail. Stay right, heading uphill. You will come to another fork shortly thereafter, and head left on that one. The route will then lead you back to a view of the falls. Alternately, you can just head straight up the creek once you get to the intersection with the boulder, and view the falls from below. More cross-country if you do this route. 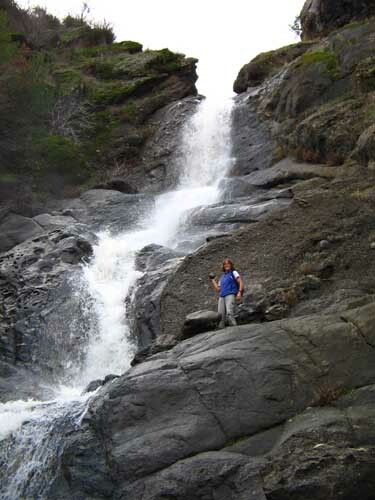 Distance: The entire hike is about 7 miles, out and back to and from the falls. 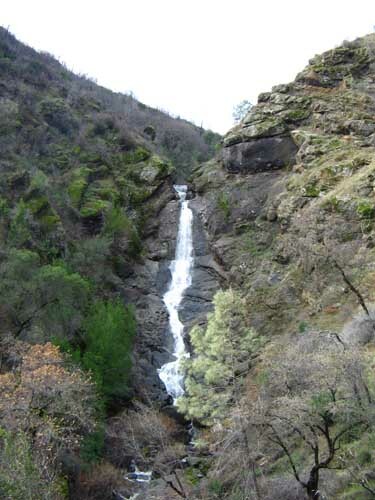 Alternately, you can make a longer, 11 mile loop if you go past the falls, follow the trail behind the falls and cross the creek south into the Nevada Creek drainage. 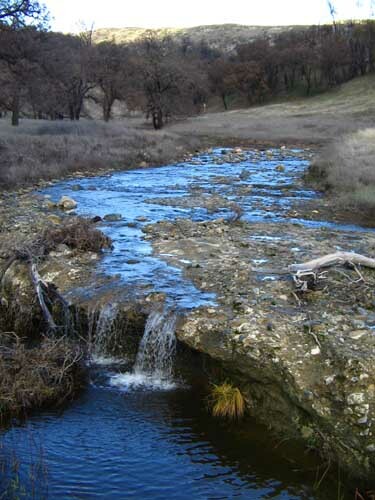 This loops around the mountain range separating Nevada Creek and Zim Zim Creek. 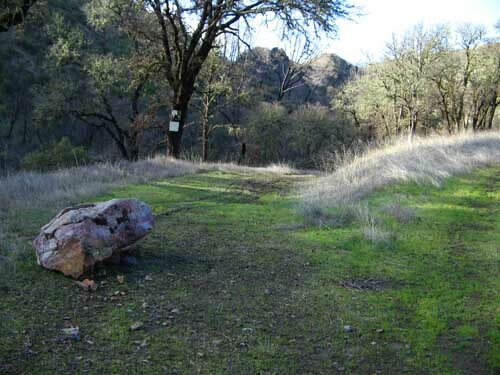 Be sure to take the correct trail to complete the loop at the southern part of the loop at Nevada Creek. The map shows that you have to take the eastern trail at the south end of the loop. There are numerous trails that branch off from the hike route.If you continue too far down Nevada Creek, you end up on private property. The GPS track will guide you if you have a GPS unit. 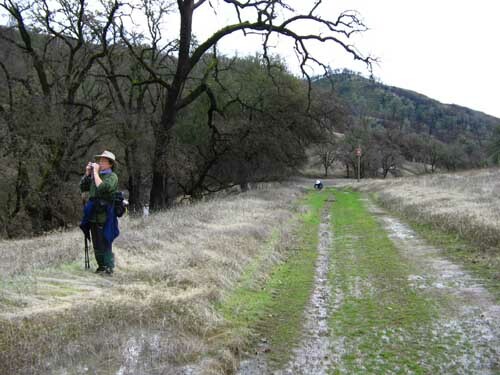 The trails are overgrown in spots, so a GPS is necessary on the loop and bring loppers as well!. 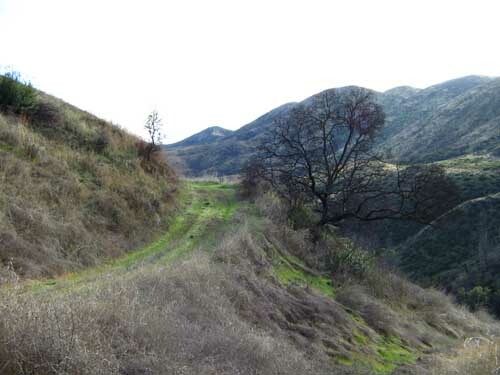 You can also do a shorter 9.5 miles if you hike the ridge west of Zim Zim creek and then cut back to Zim Zim creek. 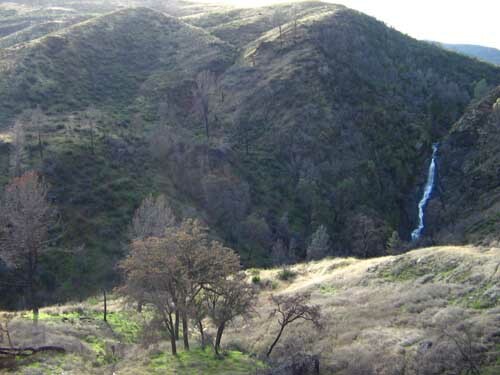 Get to the ridge by hiking the trail behind the falls and then south as if you were going into the Nevada Creek drainage. At the top of a saddle between Zim Zim Creek and Nevada Creek, take the eastern route up to the ridge. 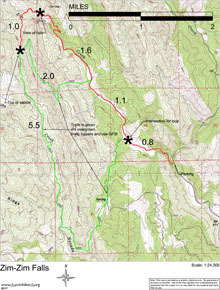 The map shows the longer loop as well as the ridgetop hike with the cutoff to Zim Zim creek. There are lots of other trails that aren't shown, since I haven't taken them yet. 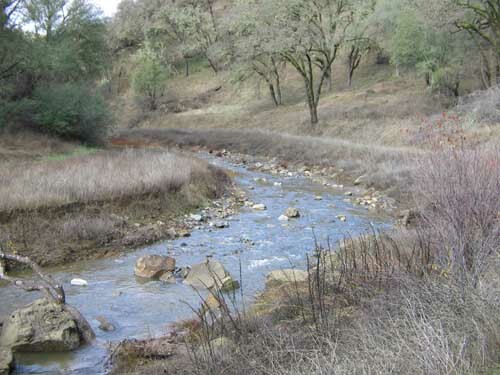 From Yolo County, take Highway 128 toward Lake Berryessa. Turn right at the 128/121 intersection, staying on 128. At the Turtle Rock bar, turn right again onto Berryessa/Knoxville road. 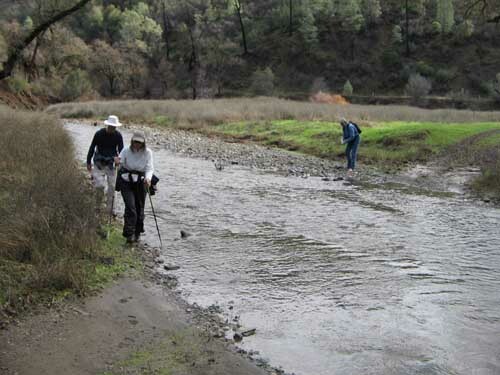 Continue on Berryessa/Knoxville, past the lake, over both Pope Creek and Putah Creek bridges at the North end of the lake, and up into the mountains beyond. The road will narrow, roughen, and you will wind up until you reach the public lands. There are several concrete low-water crossings. Parking is available across from the green gate, just before a creek crossing, just before mile marker 24. If you see mile marker 24, you've gone about 100-feet too far. I have an image of the parking area below. 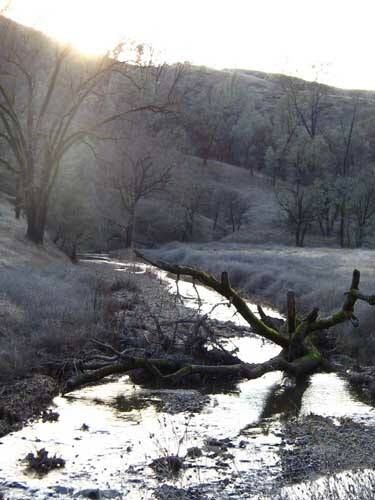 This hike is within a 12,575-acre addition to the Knoxville Ranch State Wildlife Area, which closed escrow on December 15, 2005.